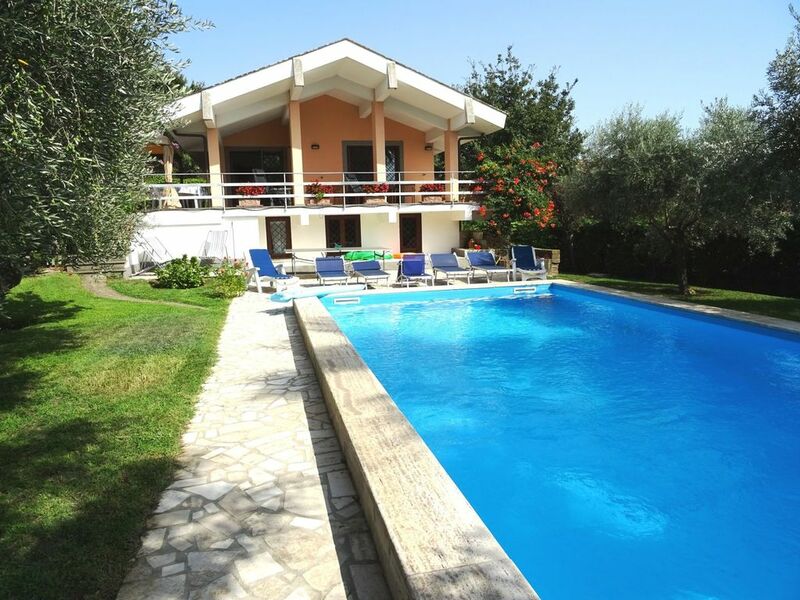 Exclusive villa for 12 plus infant near Rome private pool and park. Exclusive villa near Rome, Italy. Pool - Lakeviews - Lake beaches (5 mins) - Seaside (30mins) - Golf greens,(15 mins). It is situated on a hillside in a commanding position, at 800 meters bird's eye from Lake Bracciano. The stunning panorama of the lake and hills that embrace it can be enjoyed from every corner of the property, and come into the villa through its huge glass windows like live paintings. The property’s lovely pool,. Its lush garden bulging with colourful flowers & olive & fruit trees & its BBQ to grill fragrant steaks, are but a few of the villa’s amenities. Its 60 m2 covered patio is furnished with garden tables and chairs for open air meals, where you can also sit and enjoy your cocktail. Sunbeds, chairs, and deck chairs are scattered on the poolside solarium. Every corner of this stunning property communicates relaxation and well being. And, last but by no means least, the villa offers unparalleled 180° lake and countryside views that nothing obstructs. The fairy tale beauty nature has bestowed on this blessed corner of paradise, makes this unique property an ideal place for a dream vacation. Exclusive, 230 square meters villa (35 km from north Rome) with breathtaking lake and countryside views. It is situated on a hilltop in a commanding position, at only 800 meters from the long, sunny lake beaches and from the Centre of the Village. The Mediterranean seashore is at only 30 minutes drive, and two lovely Golf clubs are available in the area (Sutri and Olgiata) . The stunning views onto Lake Bracciano and onto the deep green Roman countryside, and the gentle round-top hills that embrace the lake, are enjoyed from every corner of the property, and come into the villa through its huge glass windows like live paintings. Located on the shore of Lake Bracciano, in the heart of Lazio’s Lakes District, away from the smog of large cities and equidistantly situated between Rome (30 minutes from North Rome) and the Mediterranean Sea (30 minutes), Trevignano Romano is situated in the very heart of the Protected Regional Natural Park of Lake Bracciano, at the northern doorstep of the Capital, and at the cross roads between Lazio, Tuscany and Umbria, which hold 60% of the country’s total artistic, architectural and archaeological heritage. The village’s medieval historic centre and its Etruscan museum are the pride of the village. Long sunny beaches, tall shady trees, gentle round-top hills and majestic Mount Rocca Romana, cuddly frame the lake . The area’s sweet climate in every season, its golden wheat fields, vivid rust-brown fertile soil, and century-old trees, surround and embrace the limpid lake waters, strictly protected against all kinds of pollution, as it is one of the Capital’s main drinking water reservoirs. While quiet and private, the villa is located very close to where cultural and sporting activities are. Furthermore, all sorts of shops and supermarkets are available at a 3 minutes drive from the property. Last but not least, the Villa is finely and lovingly furnished with a mix of luxurious modern furniture and some antique pieces, and Persian carpets are scattered on the floor inside the villa. All bedrooms are furnished with love and great attention to details. The property offers innumerable amenities: A charming private swimming pool, a 70 square meters marble paved solarium located by the pool, and furnished with sun beds, deck and garden chairs, to sunbathe and relax, and a ping-pong table is also placed by the pool for added family fun time. The 60 square meters shaded patio, with stunning lake views, is furnished with garden tables and chairs seating 14 persons, and offers the perfect setting for open air meals. The villa also offers an extensive, well manicured private park (2500 square meters) with large lawns, and an explosion of multicolored flowers, fruit and olive trees. An outdoor brick barbecue is placed in the garden to grill your fragrant steaks while sipping an excellent glass of Italian wine. The whole property has been conceived and realized to be the perfect place for relaxation, well-being and for a totally out of common vacation. The wonderful beauty nature has bestowed on this blessed corner of natural paradise, immediately stirs the desire to relax, explore, discover and enjoy, and you are instantly pervaded by the feeling that your memorable vacation has just started. Amenities indoors: Very large living/dining room on the garden floor with an open fireplace and direct access to the garden and the pool- Large living room with fireplace on the upper floor with direct access to the patio, the garden and the pool - 4 double bedrooms with king size beds - 1 twin bedded room ( beds can be made into one upon request) - 1 bedroom with 2 single bunk beds - 1 baby bed can be provided upon request free of charge - 1 full bathroom/tub/shower cabin/WC/bidet/washbasin - 1 full shower room with WC, shower and wash basin- Local maps and free wireless internet access are available.- Deck chairs - Radio with CD player - Books - Hair dryer -High chair - Security windows and doors - Independent heating system. Long term rentals considered . Amenities outdoors: Large private swimming pool with marble border open from May to mid October - 70 square meters marble-paved solarium by the pool, and furnished with sun beds, deck and garden chairs for sunbathing and relaxation - A 60 square meters shaded patio, furnished with garden tables and chairs seating 14, for open air meals – Well manicured 2500 square meters enclosed park - Small secluded Belvedere, furnished with a coffee table and chairs for two, and overlooking the lake and the pool - Ping pong table - Private fenced-in parking area for 3 cars - Automatic sprinkling system - Low allergen - Long term rentals available. Lake Bracciano occupies an area of 57 km2, is 160 meters deep and has a perimeter of 33 km. Furthermore, Trevignano bulges with restaurants, pubs, pizza houses and lake shore cafés. They all offer a romantic atmosphere and exquisite Italian foods and wines. To them, EATING IS AN ART. Due to its highly privileged geographical position, Trevignano Romano has become, over the last twenty years, an extremely popular holiday destination, and Italians, as well as International vacationers, come over to enjoy their well deserved vacations in a fascinating setting of natural beauty. Rome and the Vatican city are close by. Take a walk inside Rome, and admire its lovely little “piazzas” and its honey-colored “cupolas”. While wandering around it, ancient, narrow, winding streets, shall all of a sudden open up and a lovely “loggia”, a mysterious church, an imposing basilica or a luxurious store come your way… Sporting activities: Trevignano offers numerous sporting activities: Wind surf - sailing - swimming,- canoeing - horse riding - scuba diving classes – tennis - ping-pong - cycling, trekking - lovely tracks designed for walking in the surrounding green woods. Last but not least, two lovely 18 holes Golf Clubs are available in the area (One at Sutri, at 11 km from the Villa, and the other at Olgiata, at some 20 km from Trevignano). There are lots of Must-see places in the immediate vicinity of Trevignano. The village lies in the heart of “Tuscia”, at the immediate outskirts of Rome, a land where frenetic modern life is banned, and where the relaxed rhythm of life is still dictated by century old farmers traditions. In Tuscia, one can admire a unique monumental patrimony, consisting of Etruscan necropolis, imposing castles, and mysterious churches, that reveal the cultural and artistic evolution which took place along the centuries in this rich land. In Trevignano’s immediate vicinity, there are innumerable places that should not be missed: Viterbo and its medieval “Pellegrini Quarters” as well as its “Popes’ Palace” - Bracciano and the medieval palace of Prince Odescalchi - “Sutri” a lovely Etruscan village, perched on the top of a tufa stone hill as well as its lovely Golf Club - The little village of “Canale Monterrano” and its Etruscan necropolis - Charming, little “Calcata”, the village of painters, where an international community of modern painters live and exhibit their work - Farnese Palace, located in lovely “Caprarola”, and “Farfa”, and its “Abbey of Santa Maria”, one of the most important sanctuaries of the middle ages. Furthermore, there is a lot of family fun places to visit and savour: A day at the zoo in North Rome and a day at the Marine Zoo in torvaianica are thoroughly enjoyed by adults and children alike – A walk in the “Parco del Treia” with a stop at the charming waterfalls (which in winter solidify and become a real natural sculpture) – Take the scenic drive to Lake Vico, follow the lovely contour of the lake then proceed up to the mountain to enjoy breathtaking views from a commanding position- These are only a few of the places that should not be missed. The villa, and the whole village, stir in you the desire to explore and discover, and pervade you with an instant sense of relaxation and vacation. Other Activities: Ping Pong table available at the villa - Wind surf and sailing schools available on the lake. I am a former United Nations Staff Member. I was born in Cairo and studied from kindegarden to High School at the Heliopolis French Lycée. I then studied Economics at Cairo University. I speak five languages and therefore decided to also study Simultaneous Interpretation in Rome,. where I live . I have travelled extensiveley for work as well as for fun. For ten solid years, I have been looking for a property near Rome, with very special lake views . One day, at long last, I found it, the following week I bought it! When my working activities allow me to, I spend as much time as I can at the villa. When I wake up in the morning, I prepare my cappuccino, sit in the patio, and enjoy the stunning lake views, the astounding colours of the flower beds, and the lush garden, and I feel happy and in peace with myself and with the world. My family and I have always been deeply in love with the Lakes District near Rome. One day we decided to have lunch at a charming restaurant on the lake shore, in Trevignano Romano. After lunch, we went for a coffee at a lake shore cafe'. While sipping my coffee, I accidentally heard the owner telling a gentleman that he had a plot of land with fascinating lake views for sale. I immediately asked him to visit the land. And it was love at first sight ! We bought the land, and built our dream home in that corner of paradise. The villa is located in a very privileged geographical position : At Rome's door step, at the cross roads between the 3 most important regions ( Lazio, Tuscany and Umbria) which hold 60% of the totality of Italy's artistic and architectural sites. The natural beauty of this area, the availability of all sorts of shops and services and of innumerable sporting activities, plus the countless places to see, are but a few of the assets the area offers. If you add to this the renown quality of the Italian cuisine and wines offered at the countless restaurants which dot the lake contour, you realize that Trevignano is THE right location for a memorable vacation. All bathrooms are luxurious, and tiled with top class Italian tiles and top class WCs, bathtub, shower cabins , sinks and bidets. 2 living rooms, one per floor with an open fireplace on each floor, and direct access to the garden, the Patio, the Pool, the sun deck and the Park. All sorts of books, in several languages, are available at the lower floor book shelves. Two lovely golf greens are available in the immediate vicinity. One at around 10 km ( Le Querce), and the other at around 18 km ( Olgiata). This lovely stand alone villa, is built on a hillside on two levels. It offers breathtaking lake and countryside views, a lovely private pool and a 2500 square meters private park bulging with flowers and fruit and olive trees. It also has a 60 square meters shady patio furnished with garden tables and chairs seating 14 for open air meals, an open air furnished conversation corner, a marble-paved sun deck by the pool, furnished with sunbeds, deck and garden chairs, a paved BBQ area with a brick barbecue, and private parking for 3 cars. Table fans for all rooms are available at no extra charge. Our immediate impression on arrival to the property was to breathe a lovely sigh of relaxation. The stunning vistas from the property overlooking the lake are impressive as is the incredible amount of greenery from the surrounding hills. The villa itself is perched above the lake on the hillside, a little less than 1km from the town of Trevignano. The villa was clean and comfortable with plenty of space inside and out for our group of 10. The highlight of the house has to be the lovely balcony/ patio where we ate almost every meal overlooking the lake view, pool and beautiful gardens. The pool was clean and the gardens are exquisite with plenty of mature fruit trees, flowers and olive trees. It was so lovely to just sit in the garden and relax! Our group stayed for a week, we had no problems or issues with the property during our stay. The property manager Malak was very helpful and available for any questions that we had. She is a really lovely lady who gave us some good tips on the surrounding area. The town of Trevignano is quaint and picturesque, filled with little stores and tons of waterfront restaurants. On the weekend that we were there, they had a lovely open air market all along the shoreline and an open air music show. There was lots of stuff for the kids to do too, and although it was still not high season there were people taking advantage of the beautiful weather and swimming in the lake and playing on the beaches. The lake area is very clean and pristine as it's apparently a fresh water reservoir for Rome. There are 2 supermarkets in the town, one large Carrefour and another smaller more boutique/ gourmet type supermarket. The town has a bank/ ATM, pharmacy, shops etc. so in case you forget something it's not a problem to find. We did a lot of walking in the area, from the villa to the town and around the lake-shore, it's really picturesque and so relaxing!! We all commented on how rejuvenating the whole stay felt, perfect to recharge our batteries, we all discussed returning next year (2018) for another vacation! I have no problem recommending the villa and the area to others looking for a retreat/ peaceful getaway in a beautiful (and relatively un-tapped) part of Italy. Two thumbs up!!! That was a truly lovely group! I was so happy they all enjoyed their stay so much at Villa IL GLICINE, and hope to see them again next year. When we arrived at the villa, the downstairs bedrooms smelt damp and musty, possibly because we were one of the first bookings of the season. However once the house was opened up and aired, it was perfect for us all. We were a party of 7 adults and an 18 month old. It was a bit tricky with the 18 month old to ensure her safety, however that is our responsibility and we managed fine. We were concerned that the pool house door wasn't locked, it could be a hazard for older children exploring the garden. That's some of the minor negatives. We had a wonderful week in this beautiful house, enjoyed the pool, beautiful garden and stunning views. We also enjoyed the lakeshore but you do need a car as it is a steep climb back up the hill. We found Malek easy to deal with and she answered queries we had. We had no problem at all with the return of our cash security deposit, it was transferred into our bank as agreed. We would all be happy to stay in this house again. We have recently stayed in this property (June 2015). When we arrived we had a lovely welcome from the owner Malak who showed us around and welcomed us to her home. The property was very clean and spacious and felt immediately like a home from home. The house is well maintained and the gardens are beautifully kept. The swimming pool is also very clean. Over the week we had one or two issues and these were sorted immediately by the owner so no complaints here whatsoever about customer service. We had many meals on the large veranda which had beautiful views of the lake. Pictures on the site do the view no justice! There were plenty of areas to have a private chat also as we were a group of eleven and at no time did it feel crowded. The garbage collection was a bit confusing but that is the way things are done in trevignano. I would definitely hire this property again although I might wait until my children are a little older in relation to the swimming pool but this applies to all villas with pools. Would also recommend this property to a friend. I will say, unless you like walking up steep hills then you would need a car to access this villa but it is only a short five minute drive from the village. The village has supermarkets, pharmacy, bars, restaurants, nice walks by the lake and two kids play parks, one small one next to a restaurant and a bigger one past the Carrefour. There is a great little water park with inflatable rides for kids where you can relax on a lounger and dip your toes in the lake while watching the kids play . The lake beach is stoney but the kids are within running distance which is a big plus to me as I have 3 under 6. You can also hire out pedal boats and canoes. I liked the area to be honest for children, not the most exciting or visually stunning part of Italy but still beautiful and very chilled. We had a nice stay in this house! This is a nice house not very far from Rome. Lots of space inside for the kids, a big pool and sunbeds for many people. We enjoyed our stay very much! Sometimes we walked down to the village but the heat and the steep roads made us take the car mostly. It takes about 15-20 minutes to walk down. The kitchen is rather small if you want to cook a meal for 12 people, thats a minus. But the village har a lot of nice restaurants so you can go out for dinner. It was also a bit of a hassle with the garbage, but once you understand the system it works fine. Perfect family excursion in connection with 60th birthday. We found this lovely villa near Rome, when we decided to celebrate Alice's 60th birthday with all our small family. We were 11 total: our 3 children and their boyfriends and 3 grandchildren. Villa IL Glicine was even more amazing than the advertisement describes.A wonderful view out over the Lake, a very beautiful garden and a lovely swimmingpool. The owner was also fantastic. We had ordered food to Alice's birthday, which was delivered by a chef in the Villa. Really nice. We say thank you for a lovely, lovely week and can only recommend this lovely villa to others. Abbiamo trovato questa villa per caso su internet, ci sono piaciute le foto e l’abbiamo affittata per una settimana, in occasione del 30° compleanno di mia sorella. L’abbiamo cercata vicino a Roma, per permettere ai miei nonni molto anziani di partecipare alla festa, senza dover fare un viaggio fino a Grosseto, che per loro è molto lungo, data la loro età. Siamo stati benissimo, la villa è letteralmente stupenda, sia dentro che fuori, e le foto non le rendono giustizia. La festa è stata bellissima, con candele e torce che illuminavano il giardino, la piscina, il patio ed il solarium. Era da favola. La vista sul lago e la campagna è da togliere il fiato. Peccato che tutte le cose belle devono prima o poi finire. I summer, wine tasting tours can be organized. The Jazz Festival, the Short Film Festival and the numerous open air concerts are not to be missed. The nearest Mediterranean seaside beaches, lie within one hour drive : The lovely beaches of Fregene, Maccarese, Marina di San Nicola, Santa Severa and Santa Marinella, are within one hour drive, and offer - in particular Santa Marinella - all sorts of water sports and in particular wind surf and immersions to explore the underwater world!